The Infusionsoft integration helps to grow and manage your contact list with ease. It lets you add new contacts from ongoing or archived chats. Thanks to it, every time your customer starts a chat using the same email address, LiveChat will automatically display their previously saved information. What’s more, you will be able to forward your chat transcripts as Notes and assign them to the customer that you are currently chatting or have chatted with. The Infusionsoft platform allows businesses to create the sales and marketing strategy as well as map out each step. Thanks to it, you can centralize customer interactions and daily activities; capture new leads and automate follow-up based on preferences and needs. The solution lets you identify potential customers and helps to close more sales. There is no need to do repetitive tasks like follow-ups, this soft will do it for you. To add to this, Infusionsoft integrates with marketing tools which help to connect with leads (through email, social media, and offline channels). Use Infusionsoft as the central point of business. It will allow you to combine CRM, email marketing, lead capture and e-commerce in one place. With our native plugin for Infustionsoft you will make sure that the installation process will be a breeze. Also, with our tutorial we will make sure that you'll not get lost in the process. Our integration gives you the opportunity to save chats as notes, straight in your Infusionsoft. All of that with just a click of a button – and the best part of it is that you can automate this process! By simply checking a tick each chat will be automatically transferred to your Infusionsoft account. To add a new contact, simply choose one of your concurrent or archived chats and provide your customer’s contact information. As simple as that. From now on, every time your customer starts a chat with the use of the same email address, LiveChat will automatically load his personal information and display it straight in the chat. Your sales and support teams need the most updated customer details — this integration creates a new contact in Infusionsoft - or updates an existing contact - when a LiveChat chat ends. 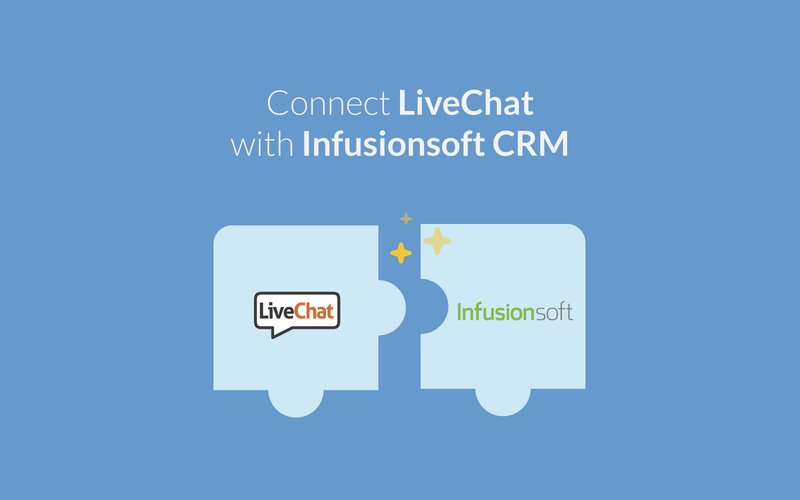 Start using LiveChat with Infusionsoft now!